tank is immersed another tank, which supplies a current of bisulphide having the same temperature as the water. 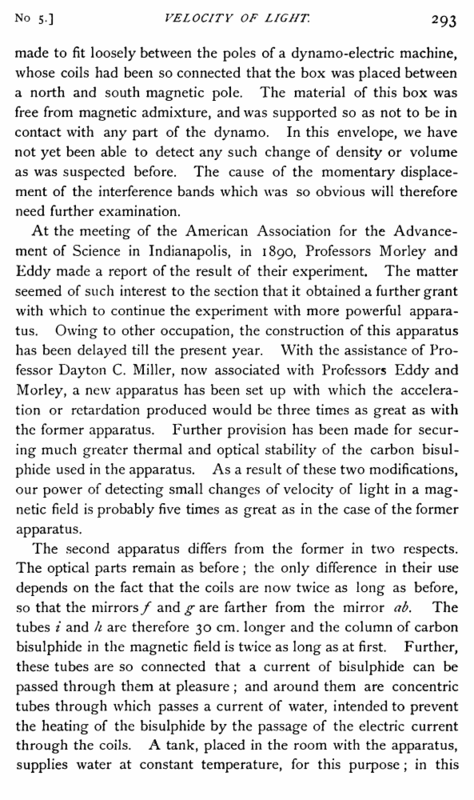 This arrangement for preventing changes of temperature in the column of carbon bisulphide in the tubes of the apparatus greatly increases the steadiness of the interference bands to be scrutinized, and so increases the delicacy of the observations. The illustration taken from a photograph shows the apparatus ready for use. At the extreme right are seen the commutator, amperemeter, and resistance coils, used in managing the electric current. The wooden stand at the extreme left carries the source of light and the condensing lens. The adjacent stone pier carries the coils; between them is seen the cubical block of stone which supports the diagonally placed mirrors ab and cd of Fig. 1. Apparently just above this block, but really some yards to the rear, is a double tank supplying water and carbon bisulphide to the apparatus. The reading telescope with which the observations were made is marked by the hanging cloth. On the left edge of the pier is seen an iron stand carrying a Nicol’s prism for polarizing the ray of light sent through the apparatus ; on the wooden stand to the right of the pier is seen the analyzer, by means of which the rotation produced was measured while the current was adjusted so as to secure the rotation desired. 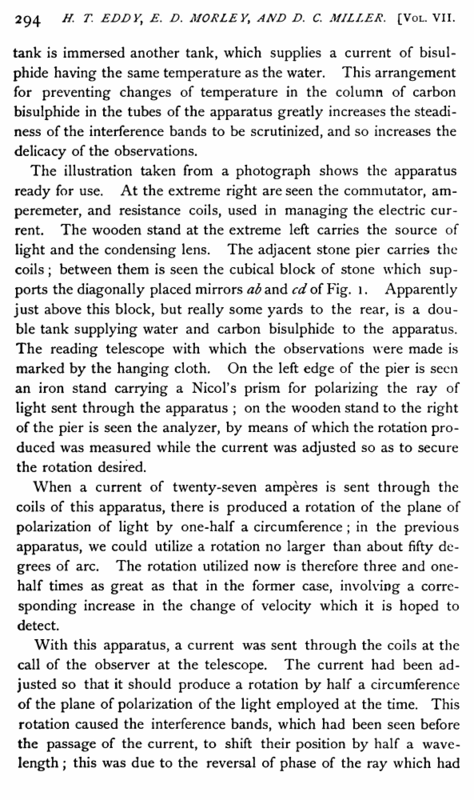 When a current of twenty-seven amperes is sent through the coils of this apparatus, there is produced a rotation of the plane of polarization of light by one-half a circumference ; in the previous apparatus, we could utilize a rotation no larger than about fifty degrees of arc. The rotation utilized now is therefore three and one-half times as great as that in the former case, involving a corresponding increase in the change of velocity which it is hoped to detect.